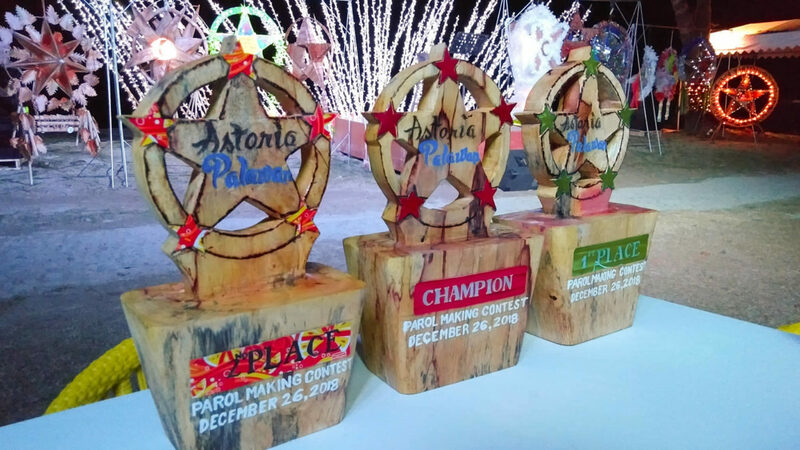 The Astoria Palawan concludes its environment-friendly parol making contest for the community. The Christmas lantern entry of the Puerto Princesa City Jail (PPCJ) won the P25,000 grand prize in the parol-making contest of Astoria Palawan on Wednesday, December 26. The city jail’s lantern which was made of coconut husks, bamboo, and rattan indigenous materials bested 13 other entries, gaining a 100 percent rate from the board of judges. The first and second prizes of P15,000 and P10,000 were won by the Iwahig Prison and Penal Farm (IPPF) which gained average ratings of 85.50 and 66.64 percent. The other entries that did not win were awarded P1,000 each as a consolation prize. The criteria of the contest are 20 percent creativity, 20 percent use of environment-friendly materials, 10 percent workmanship, 10 percent symbolism, and 40 percent from votes of around 120 random Astoria Palawan guests. Astoria Palawan general manager Jocelyn M. Suarez said it aims to promote the protection of the environment through using environment-friendly and recycled materials on the Christmas lanterns and to give back to the community a portion of the P500,000 cash prize that Astoria Palawan won in the float competition in November of the Subaraw Biodiversity Festival. “Since we won the big float competition, the management decided to give back and to share our prize to the community. To do just that, we opened this parol-making contest to the entire residents of Palawan. This is especially because we also want to connect to community-based sustainable tourism — the CBST of different barangays — and we also extended it to the Iwahig to the persons deprived of liberty,” Suarez said. The board of judges was composed of Councilor Rolando Amurao, City Police Office deputy chief Senior Superintendent Ronnie Bacuel, and Puerto Princesa City Pilot Elementary School faculty member Teresa Rogelio. The public votes which constitute 40 percent of the total rating were gathered from December 15 to 26, prior to the final judging on Wednesday night. Arnold Resurreccion, staff-in-charge of the parol-making contest for the “Paskuhan sa Astoria”, told Palawan News the entry of the PPCJ stood out from the other entries because of its unique design. He elaborated that while the participants were allowed to use only recycled and indigenous materials which they believe would best promote environmental protection, the board of judges including the public voters, may also have different concepts in mind of what an “environment-friendly lantern” really looks like. “Bukod sa colorful siya, ‘yong pagkakagawa sa kanya ay mas pulido ang dating kaya siguro mas nagustuhan ng ating mga judges. Well, kasama nga din sa ating [criteria] na at least environment-friendly dapat na materials [ang gagamitin]. ‘Yon nga lang, ang ating konsepto ng siyempre ng environmental-friendly [ay] hindi rin pare-parehas. Kung mapapansin natin sa ating [mga] parol, may kanya-kanya tayong konsepto,” explained Resurreccion. Ferdinand Ramos, Astoria Palawan’s executive chef who chaired the “Paskuhan sa Astoria” committee, said the parol-making event was embraced by the community as part of their resort offering this Christmas. Ramos noted they are planning to improve their “Paskuhan sa Astoria” next year and will make it grander in a way that would best suit the taste of the Palaweño people. “I think it will be times two [in beauty and decorations], the lights, the effects, [and] the Instagrammables. We will also come up with programs for kids,” said Ramos.